Ballroom dance has taught me many things. It’s not easy, it can be graceful, but leads must be subtle. We’ve also met many wonderful people, thus have our dance friends. 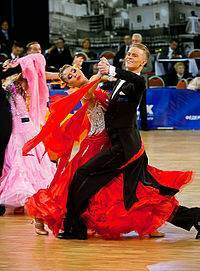 Ballroom dance is a niche, thus there is a ballroom community. Although we know only a small portion, we recognize many faces because we attend the same functions. Dancers are at all levels, yet we note differences. Many know numerous steps, but the don’t look good doing them because they’ve primarily (or only) learned from group classes – but they enjoy themselves, which is important. Others look better, but don’t know as many steps – those are the ones who take private lessons. Their timid and stiff nature identifies the beginners, but hey – all of us were there once. A handful have danced for more than 20 years, and let’s just say that some of them are very good .. the few that stand out. Even on a large floor with two hundred people, those that are trained, experienced, and/or competed at a high level are easy to identify – after all, they probably practiced, too! Reality is that most of us are between those two extremes. It didn’t take long for us to identify Madam M. As she danced down and around the floor with her competitive partner, her movements defined elegance and grace as her smile beamed joy. Madam M is a relatively tall, attractive woman, and her firmly anchored partner knew how to display her. While watching them dance, I would think – Someday – maybe someday – I will join her for a smooth dance – a foxtrot or a waltz. Keep in mind, this is 4-5 years ago, which was early in our dance experience. Over time, we’ve had several encounters with Madam M, and most importantly, she’s very pleasant. Maybe a year or so ago we were talking and she suggested we dance. Although it was a west coast swing – not my best dance – of course I accepted, … but that didn’t count as that dream dance. Later, there would be times when I would step toward her direction, but only to be intercepted by another invitation. At a recent small ballroom gathering, there was Madam M sitting alone at a table. The DJ played a Foxtrot, so I asked her to dance. We went to the floor where I offered my left hand as a starting position, she took her place then arched back into my right hand after I lightly placed it on her back. I straightened my frame, and in no time, long strides were gracefully gliding us around the floor (at least to me). I kept the patterns simple because my Foxtrot timing has gone in the toilet the past few months. The dance was wonderful, and afterwards, I told her how I just accomplished one of my goals. Her laugh and words conveyed both, That’s silly and Thank you … but my soul was beaming. A short time later, it was a waltz, thus I couldn’t resist. Again, we glided and I followed various shaping that she led with subtle precision. We were both casually dressed and in a less-than elegant venue, but it was easy for me to envision my tux with tails and her flowing gown in a grand ballroom. At the end she told me that I dance well, which I found reassuring as I checked the box on my personal bucket list … even better, I checked it twice. Watching Dancing with the Stars got us into ballroom dancing. It’s been fun and challenging. Below are some past posts that you may not know about ballroom. Enjoy, visit as many as you want, and I hope you comment on the post you visited.